That was my greeting at Scarborough train station, waiting for a half-hour taxi ride over the North Yorkshire moors to a place I had never imagined going to, for an event I had only just learned existed. The weather was how it always seems to be whenever I go anywhere, grey, wet, miserable. In fact that may have just been me, and the chipper observation from the driver did little to lift my mood after an unholy cocktail of no sleep, the then redundant annoyance of a 6am alarm, and a five hour train journey to a place dangerously close to Middlesbrough. I told him I wasn’t a goth, but that’s why I was here. To find out what one was. Anxious about the experience because they would smell me a mile off; despite my Doc Martens, despite listening to Disintegration on the train, despite my chronically mopey, pale face. I wasn’t a goth, the taxi driver was right, that much was obvious. The feeling of an outsider looking in reared its head. 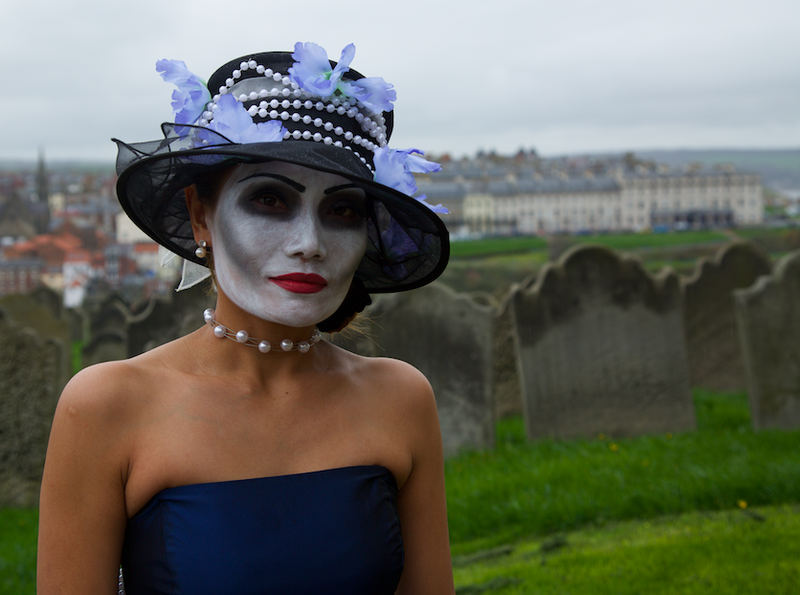 Whitby Goth Weekend happens twice a year, in April and October. It involves thousands of, yeah, goths descending on the small coastal town of Whitby and injecting something like life into the forgotten North Yorkshire seaport. It began in 1994, as forty pen-pals crept from the cobwebs and met in the Elsinore pub to plan a goth music festival. This was the pre-internet age, remember. Organising a festival from scratch, in the pits of North Yorkshire, takes some doing. It is otherworldly, Whitby, and not in a dramatic, illusory sense. It doesn’t feel like anywhere else. During the drive I had my neck craned firmly in the direction of the passenger window to analyse the moors themselves, an area of fascination due to a favourite English teacher and Emily Bronte. The gorse bushes turn a beautiful colour in the summer, the man in the front seat told me, shades of violet and pinky-purple rolling over the hills, an afterthought dabbed onto the murky hillsides by Monet’s paintbrush. Today they were brown, and I couldn’t imagine that they could be any other colour than brown. 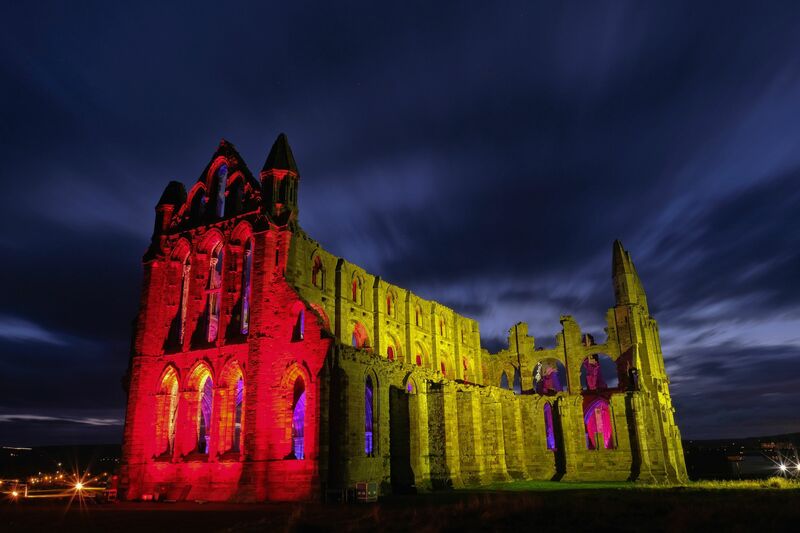 Whitby Abbey appears long before you reach the town itself, the ruins of a 7th century Monastery ransacked during Henry VIII’s dissolution. You loop around before dropping into the exact centre of the town like a hawk circling a vole, or water swirling down a basin. A cemetery sits along the way, which is ominous, and a Sainsbury’s, less so. The air feels clean and fresh and the smell of the sea confirms what you had already suspected, that yes, yes you will be having fish and chips at some point today. A seagull will harass you, or you it. It will probably rain. It will be windy and your umbrella will fail, collapsing inwards into itself, like a black hole, right when you need it most. The beach is more stone than sand; welcome to the great British holiday, welcome to the coast. The Abbey was home to Caedmon, England’s first poet, an illiterate cow-herder who sang hymns using words of which he had no prior knowledge. The last line of his gravestone, found in St. Mary’s Churchyard, reads: "Fell asleep hard by 680." As far as metaphors for death go, it&apos;s delicate. By the turn of the 19th Century Whitby was a major port. In 1790 it was the third largest ship builder behind only Newcastle and London. In 1814, eight Whitby ships caught 142 whales between them. Today two whale jaw bones, 20 feet tall each, form an archway on the West Cliff, framing a view of the Abbey on the opposite side like a photograph fading above the fireplace. They are symbolic of a time before the town itself fell asleep hard, before post-industrial decline set in. Before the area’s remote location and underdeveloped infrastructure, combined with ongoing fluctuations in the fishing industry, meant it could never become more that it was. A dot on a map somewhere. After the whaling came the jet mines and the iron ships, and after that the shelling of the First World War. Since then there isn’t much to say. Young people grow up and leave. A mile away there is Saltwick Bay and 160 million year old dinosaur fossils. Some of the young people stay. If they do, it’s usually for their entire lives. Still, it was a dot at least. People knew of Whitby. It just sort of remains there, somewhere, silent as the world changes around it, even as the goths temporarily turn a quiet seaside town into the most interesting place in the world; Whitby as idle as a painted ship upon a painted ocean. 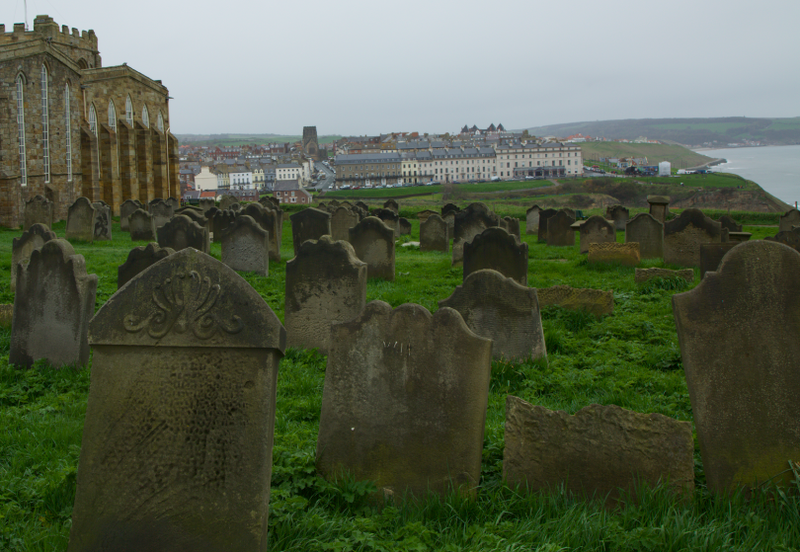 It wasn’t immediately clear that this was Whitby Goth Weekend on arrival, though. The main reason being I couldn’t see any goths. I could see approximately zero goths, which was obviously a bit of a disappointment, having travelled over 250 miles with the sole purpose of seeing and speaking to some. As starts go, this fits somewhere between Dad getting disqualified for jumping the gun in a sports day relay and a Formula 1 car spontaneously combusting whilst still sat on the grid. I had been invited along to the Friday morning meet-up at the Spa Pavilion for people who hadn’t been to the festival before - the “Virgins Meet-up”. Reluctantly, I did not attend. 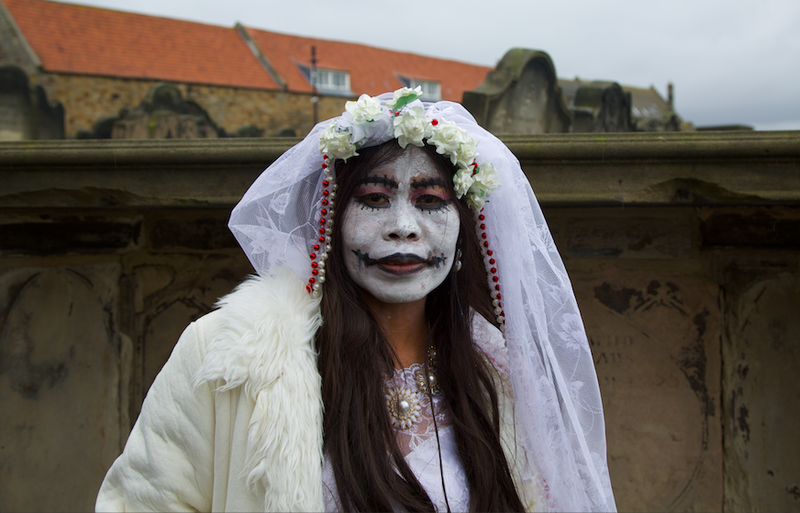 Many say Whitby is the chosen location for the Goth Weekend due to its use as a setting in Bram Stoker’s Dracula, after the Irish writer visited the town for his summer holidays in 1890 with an embryo of a novel in his mind. He discovered the name Dracula in the public library reading about Vlad the Impaler and learned, probably from the townsfolk, of a Russian ship called the Dimitry that had washed up beneath the East Cliff several years earlier. "We’re Gothin’ it up in Whitby." In the novel this becomes the Demeter, the vessel upon which Dracula hides himself to be unknowingly transported to England by its crew, whom he picks off one by one on the long sail across the Arctic Ocean. The town’s fishermen follow the ship by searchlight as it is steered into Whitby harbour during a storm, with only the dead captain swinging from the wheel, his very last act being to guide it into port. As the ship crashes on the sand, a shadow thought to be a large dog bounds away from the wreckage up toward the church and gravestones precarious above the cliff, their names long since erased by the waves and the air. During the voyage only one of the crew manages to escape Dracula, throwing himself through a blanket of fog into the dark, wild sea. The captain watches him, tethers himself to the wheel with rope and remains, knowing he is not quite alone. In truth, the real reason Whitby was chosen as a location is because the 40 pen pals felt generally accepted in the town at a time when, usually, they were not accepted at all. The peculiar synthesis first became obvious in the town&apos;s Wetherspoons, as I overheard a man in a black tracksuit, of course, telling whoever was on the other side of the phone: “We’re Gothin’ it up in Whitby”. He wore white Nike trainers and white socks pulled up over his bottoms. His wife sat opposite him in full Victorian dress. Later I saw a steampunk (which are very different to goths, and almost universally disliked by goths), dressed like he was embarking on a trip across the continent in a hot air balloon while carrying a pint of milk home. Minutes later a giant of a man with a ponytail, full-length leather coat and those contact lenses people wear at Halloween parties smiled and waved at me whilst sipping a Newcastle Brown Ale outside one of the central goth hangouts; a pub called The Dolphin, spirit animal of goths the world over. There was an obvious incongruity to it all, day-to-day working class England made phantasmal, shifted to the boundaries of your vision. Meanwhile centre stage between the curtains was… this, grainy television footage of a ghost town turned technicolour. Horror author Die Booth planned to meet me in a small pub called The Little Angel. He informed me he was sat in the corner with his partner Mark "next to the lady in the pink fishnet tights." I was thankful for the direction, I wouldn’t have spotted the two men clad in leather jackets in the corner sipping ale. Die, real name James but I prefer Die, said his first experience of ‘goth’ – whatever that means, and it means a lot of things – was reading horror stories as a child. He now has several collections of short stories and a novel to his name. I asked him why he thought goth had survived longer than other subcultures. He quickly corrected me, pointing out with eloquence: "subcultures don’t actually die – they burn brightly and then they fade out." For the masses, they are easily forgotten, or ignored. For the people they actually mean something to, they only shrink from the light, they never die. For both men it was music that served as the tipping point for the "slow slide into goth," as Die puts it. He might as well have been describing the transition of Whitby itself. It was ‘She Sells Sanctuary’ by The Cult that proved to be his gateway drug. For Mark it was an album. Christian Death’s Only Theatre of Pain. Goth started as a music scene, of course, but there is no such thing as goth music. The family tree begins with Bauhaus’s ‘Bela Lugosi’s Dead,’ a nine-and-a-half-minute long slasher film, all static and echo and metallic clangs. It was recorded in a single take and became the harbinger for everything to come from Joy Division to The Cure to the bands they were most looking forward to seeing this year: Sigue Sigue Sputnik, Skeletal Family, Cold In Berlin and 1919. We spoke briefly about Lil Peep, the self-proclaimed goth of the Soundcloud rap world who overdosed in 2017, and we spoke about all the artist’s badges stitched into the lapels of Mark’s jacket. It is no coincidence that goths usually find their way into the arms of the subculture during their teenage years, when meaning and identity are most crucial. 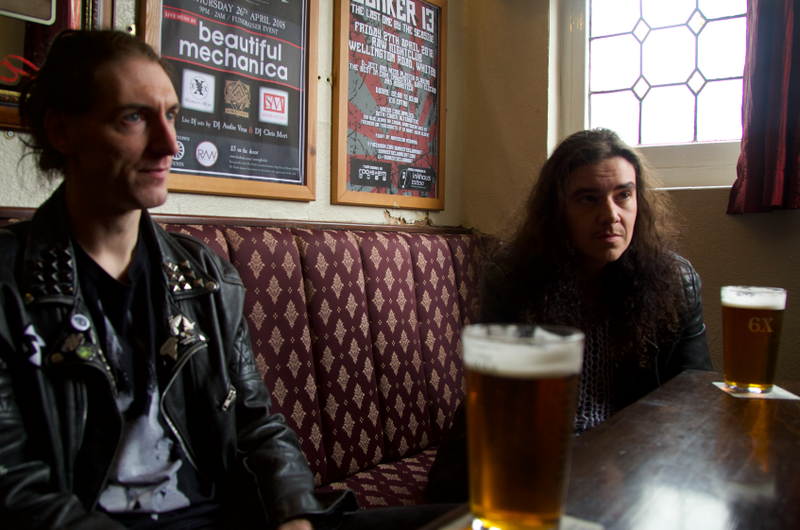 James and Mark both believe that the progressive, open and welcoming attitude of the goth community to loneliness, depression and mental health issues were important. "It’s about introspection" Mark says, pointing out that young people have the unique knack of being able to tell if something is authentic or not, and consequently becoming immediately put off if it isn’t. Needless to say, the goth scene was. "It was real." They told me it was almost disappointing they weren’t getting the same heavy-handed opposition they were used to growing up, which typically involved people shouting "GOTH!" at them, and throwing things, as though they were in fact unaware of how they were dressing. As though it was all by accident. That the leather and chains and boots had assembled themselves into a cohesive body-armour by way of falling into a dark wardrobe and tumbling down the stairs within. In 2007, Sophie Lancaster and her boyfriend were attacked by five teenagers as they were walking home through a skate park in Lancaster. Due to the horrific injuries sustained in the attack, Sophie entered a deep coma and was put on life support. Less than a fortnight later hospital staff turned it off. 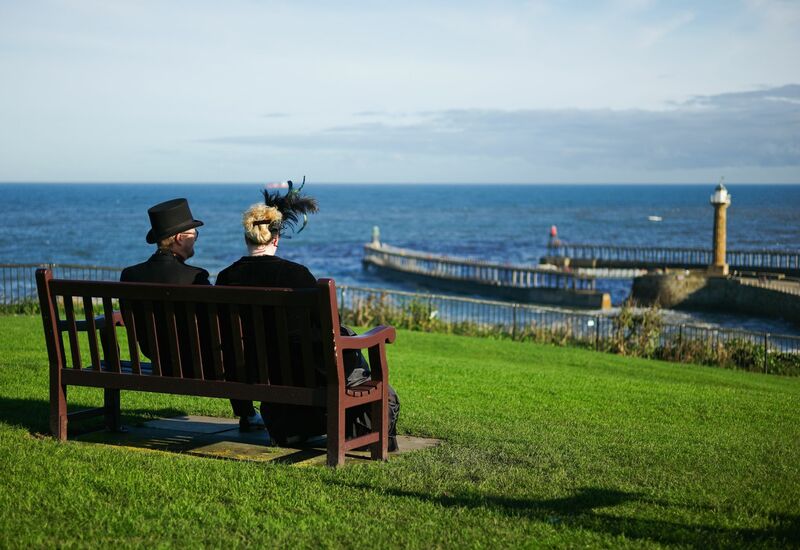 Goth gigs and club nights were held in her honour across the UK and Ireland, including during the October Goth Weekend that year, and a memorial bench now sits on Whitby&apos;s West Cliff bearing her name. As I’m about to leave the opening riff of ‘She Sells Sanctuary&apos; interrupts from the speakers and Die points up and smiles. They tell me their plans for the evening, and those plans involve karaoke. Less than an hour later I found myself in the company of two goth ministers, qualified to perform wedding, funeral and baptising services (I’m not sure by who – but I didn’t want to ask). One of them looked like a lesser Mad Max: Fury Road character. Important enough to stand on a car with a flamethrower but not important enough to speak more than two lines of dialogue. He told me that at his wedding (specifically his goth wedding – he had previously had a normal wedding, presumably before he realised he was a goth, and a goth in love at that) he had hired out a 1950s double-decker London bus. Seeing this didn’t do much for me as I had been to a wedding, and I had been to a wedding via an old double-decker bus, he then began to describe the funeral wake that was happening next door concurrently to his special day version 2.0. After the funeral, he went across and invited all the mourners to his wedding reception, he said. They joined him for the party, he said, and they "shut down" the entire village, he said. I wasn’t sure I believed him, I thought, but his expression, his eyes, his sharp nails, and his suddenly pointy teeth told me that perhaps there was some truth to the tale. They showed me their handmade and terrifying face-masks, donned only at night. They told me how they grew up as skinheads to avoid being beaten up and how their boots cost upwards of £300. Across the road a Shoezone wilted with "closing down sale" stickers. Around one in every 13 Whitby residents is employed in the accommodation and food service industry, a tourism-reliant sector that increased by a staggering 40 per cent in the decade between 2001 and 2011, even as the overall population in the town continued to age. 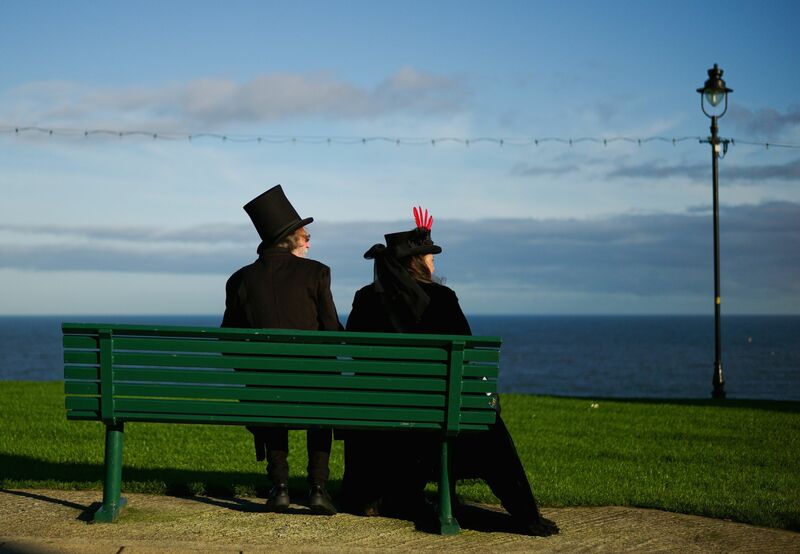 In 2012 it was calculated that goths bring £1.1 million into the Whitby economy per annum by bookending the peak holiday season in the summer. 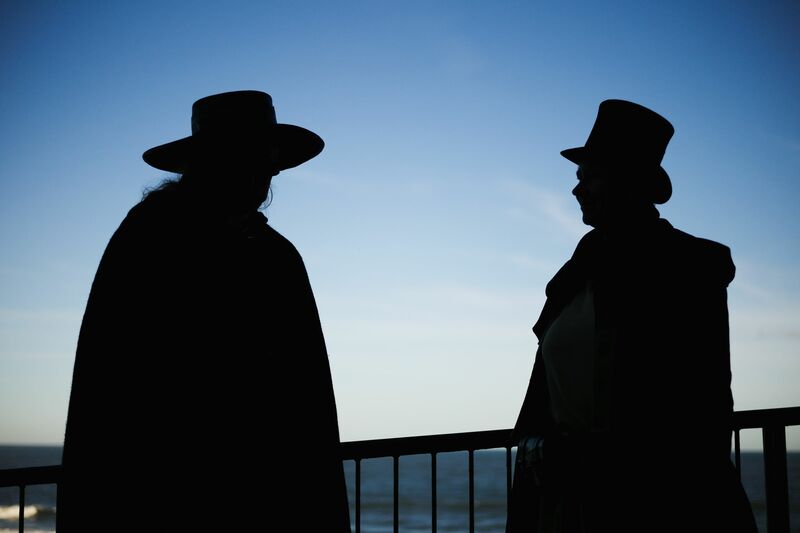 There were many local shop owners and restaurateurs, barmen and women in Whitby and their thoughts on the festival never deviated far from either great or fantastic, both for the town and for business. Justin Chocolatier on Church Street began almost 40 years ago, after Justin Coope moved to the town aged 24 to start his own business. He died in his flat above the shop in 2012, but the famous fudge and toffee shop is still there with five stars on Trip Advisor. Judy, a lifelong resident there to offer me a taste of Dracula&apos;s Dream Fudge, explained that even after all this time, the Whitby Goth Weekend was still something the residents always looked forward to. She doesn&apos;t like chocolate herself, she explained, even as the Dream Fudge quickly lived up to its name. Whenever a procession of ships came into the harbour to dock, the town&apos;s central bridge had to be lifted and, despite it being no more than 30m long, it took quite some time. During the wait, crowds of people linger at either end of the bridge - souls looking for the ferry across the Styx. I was told that during the weekend’s busiest periods I would not be able to see or move as this area would be "wall to wall goths." I’m glad it wasn’t and I’m glad I could see the distinction between them and the residents as they stood and waited before crossing. As they did so it was then that all of the bodies merged into one and disintegrated together, one idea with another. Some veered left and disappeared up the 199 steps towards the Abbey. Others wandered the cobbles and lost themselves in alleys and alcoves. Within a minute they had all vanished out of sight, they were there and then they weren’t. Hidden by the narrow side-streets, shadows and mist, a mirror of Jonathan Harker&apos;s first encounter with the count’s three wives. "They simply seemed to fade into the rays of the moonlight and pass out through the window, for I could see outside the dim, shadowy forms for a moment before they entirely faded away." On the journey up and back out and south towards Scarborough, another taxi driver told me about the town, how he had once owned a B&B and how he had to give it up after the tourism died. But it hadn’t died, I reminded him, and he agreed. Earlier that day he had “taken t’goths t’leisure centre and t’Spa,” apparently very popular destinations. He said something about the weather and something about daffodils. I turned my head out and couldn’t see anything this time as thick fog began to coat the moors. Condensation began to seep across my window from outside to in, and then I could see even less.